The character of Lucia in my novel, The Secrets of Dr. John Welles, started out as one of peripheral importance. I created her simply to serve in the role of head cook to John’s Aunt Prudence, but she evolved into someone much more important. Just short of handling finances, it was understood that Lucia ran the household. She also ran Prudence with a style somewhere between a tough love guidance counselor and a wise, older mentor. Lucia also came to John’s rescue in the years following his brief service during World War II. John was unable to deal with the horrors he witnessed and most specifically for the one he caused that he kept secret from those he loved. One day over a breakfast of popovers and orange marmalade, Lucia suggested that John go on a journey taking him away from his family so he could deal with the ghosts haunting him. John’s Aunt Prudence was heartbroken at the suggestion, but Lucia knew John needed time away to heal his mind and body. Besides, she would still be in Baltimore tending Prudence more as a close friend than as an employee. Prudence would only admit if pressed to say, but her relationship with her feisty cook was exactly how she liked it. The following recipe is the one I had in mind when I wrote the above-mentioned scene. 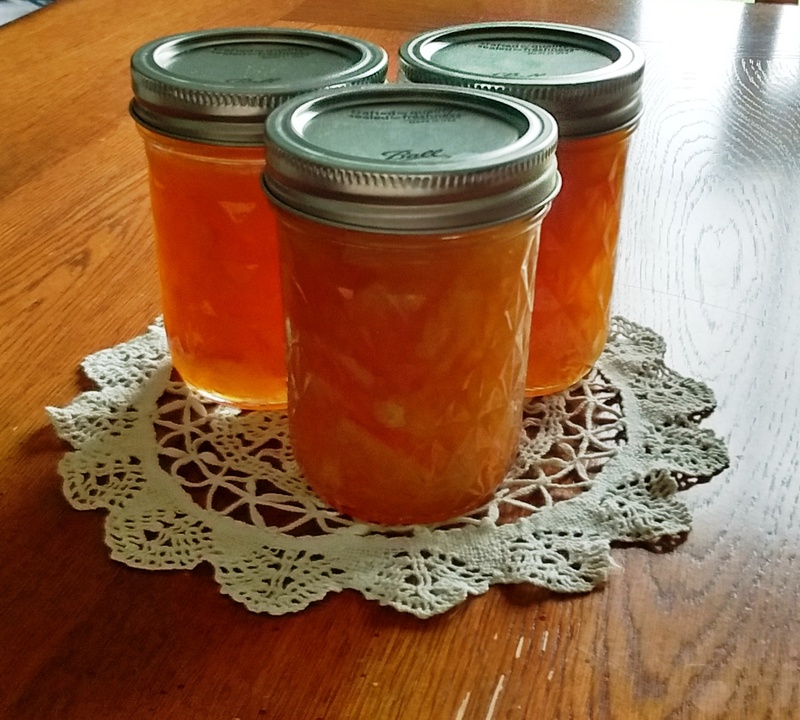 There are some nice orange marmalades on the market in upscale food shops, but nothing quite compares to the flavor of homemade orange marmalade. 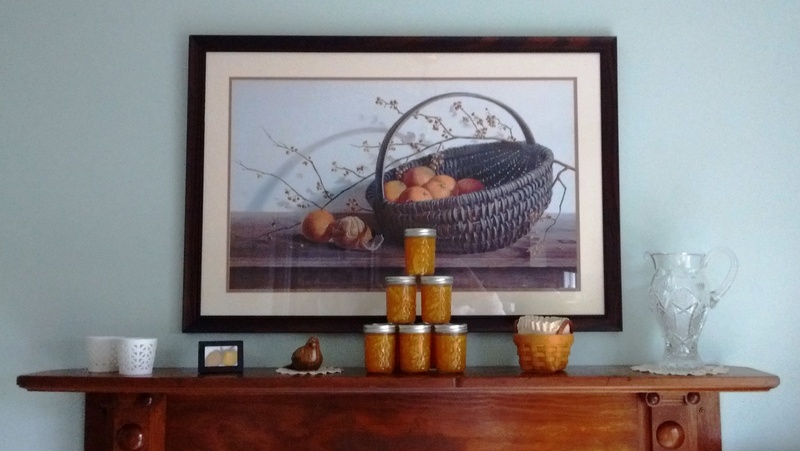 Not only will your house smell wonderful while it’s cooking, the taste of homemade orange marmalade on toast, vanilla ice cream, or whole grain pancakes defies any description of deliciousness. Wash the oranges and lemon using a mushroom brush or another type of soft, clean brush. Cut the oranges into 1/8 inch slices. Remove any seeds. Cut the stacked slices of orange into quarters. Trim any thick pieces of rind into slivers to use. Place the oranges in a large cooking pot. Zest the lemon and juice it. Add the zest and juice to the oranges in the pot along with the water. Bring to a boil over a high heat. Reduce the heat and maintain a bubbling simmer. Stir frequently and cook for forty minutes until the rinds of the oranges are tender enough to cut with a spoon. 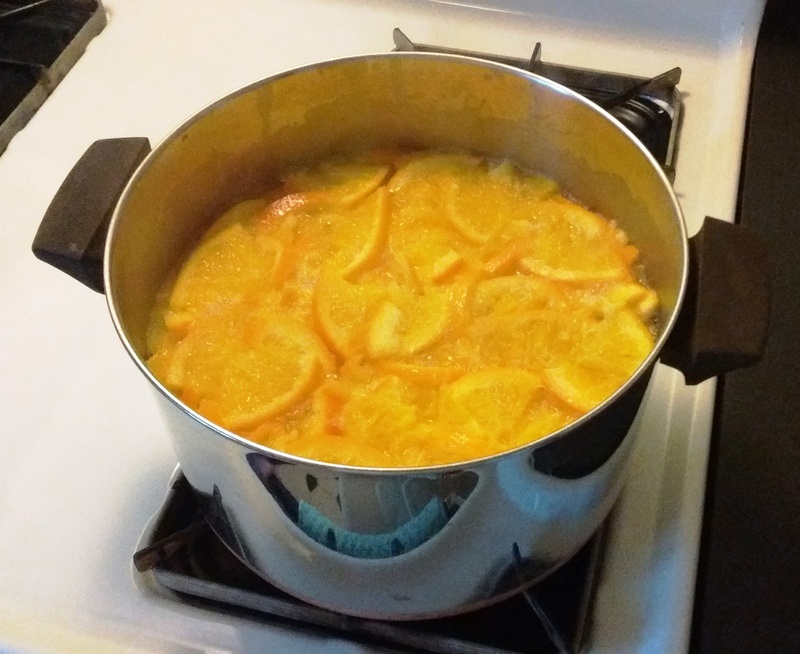 While the orange/lemon mixture cooks, bring a large pot of water to a boil and place the canning jars in the water. Sterilize the jars by boiling for ten minutes. Turn off the heat and add the lids and rings. Let everything sit until the marmalade is ready. You may need to do this in two separate pots due to the quantity of jars. After the orange/lemon mixture has cooked for forty minutes, add the sugar and return to a full boil. Stir frequently so the sugar doesn’t burn and the mixture doesn’t stick to the bottom of the pot. Boil until the mixture reaches 223° on a candy thermometer. This process should take at least twenty minutes, but depending on your stove and/or cooking pot of choice, it may take longer. Keep a close eye on your thermometer and watch as the mixture darkens, turns glossy, and thickens. Adjust the heat if needed to keep it from boiling over. To test the readiness of the marmalade, place a saucer in the freezer to chill. A small dollop of the marmalade placed on the chilled plate and allowed to cool should gel and move slightly. Anything runnier and the marmalade isn’t ready. Keep cooking, and watch your thermometer. When the marmalade is ready, remove the jars from the water and drain on a clean towel. Carefully ladle the marmalade into the jars to just below the threads of the jar. Using a ladle and slotted spoon ensures that you don’t end up with too much peel or too much liquid for the jars at the end. Keep the juice to rind mixture balanced in each jar. Wipe the rims and threads of the jars with a clean, damp cloth and top each with a lid. Add a ring and tighten securely. You may use fewer jars than the recipe called for, but I suggest having fourteen ready just in case. Bring water to a boil in a water bath canner (approximately half full). Using the canning rack, add the jars of marmalade to the boiling water. Add additional hot water to the canner if needed to cover the jars at least one inch. Boil for ten minutes. Carefully remove the rack of jars and set on a clean towel in a cool, dry place to come to room temperature. You should begin to hear the lids pop indicating the jars of marmalade are sealing properly. Do not move for 24 hours. Refrigerate the marmalade once a jar has been opened. Unopened marmalade will last for up to six months. Great Article. Excellent Recipe I can’t wait to read your book The Secrets of Dr. John Wells.